This 1980s addition to Prague’s National Theater is perhaps one of the most unique arts venues in the city. Prague’s New Stage is the only place in the city where you can see everything from classic theater to contemporary dance and ballet to legendary multimedia performances combining large screen projections, theatre performance, dance and even circus. Here, black light theater is paired with live physical expression in one of the city’s most controversial brutalist building designs. The hightlights of the season are Little Prince, Cube and Magical Circus, the latter being on the repertoire for 40 years! Find more information about the theater’s schedule here. The holidays are a time to savor something sweet, and Prague’s best bakery is ready to treat. Celebrated baker Lukáš Skála’s confectionaries are inspired by his travels around the world, and here you can find an array of classic Czech and international flavors. Stop by the display case for fresh chocolate bon bons, pastries, and ice cream cakes, or place a custom order to share at your next holiday party. Find more information about the bakery here. You can’t truly experience holiday cheer without visiting one of Prague’s traditional Christmas markets. For years, the city’s markets have been praised as some of the best in the world, and this venue is exemplary of that praise. Skip the crowds of tourists at the locations in Old Town and hang with locals at this classic venue. You can’t miss the fifty-meter high Christmas tree twinkling against the backdrop of the neo-Gothic Catholic Church from the 1800s. Here, you can enjoy traditional foods and pick up Czech-made gifts like wooden toys, candles, and ornaments. 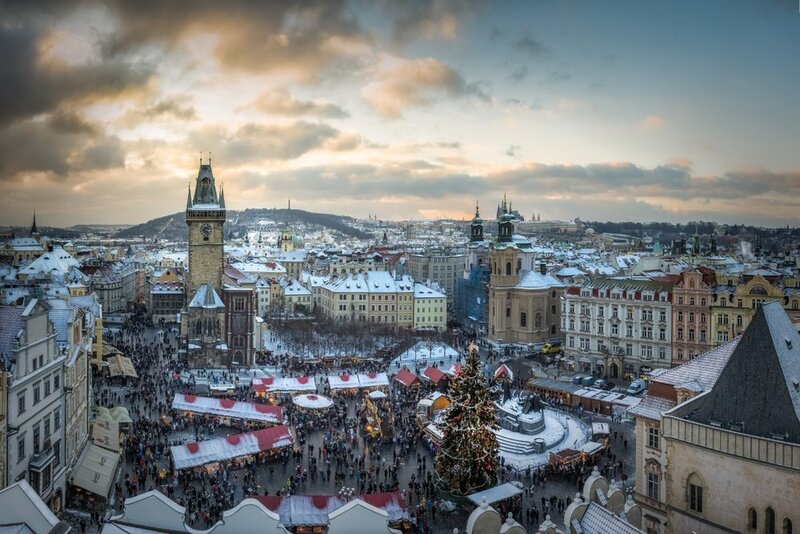 Learn more about Prague’s Christmas markets here. Take a break from the ordinary and experience a Christmas setting unlike anywhere else in the city. To celebrate its first holiday season, Czech Republic’s premier food market has been transformed into a winter wonderland complete with igloos, Christmas tunes, and all the hot wine you can drink. Manifesto redefines the typical Christmas market by showcasing a unique space that is both elegant and cozy while featuring some of the city’s best purveyors. Pick up gifts for friends and family at Manifesto’s exclusive crafts market presented by LeMarket and enjoy a vast variety of delectable treats like fresh lobster rolls, tasty pho, and traditional southern barbecue. In between shopping for presents, learn about one of the country’s most revered artists at this rare retrospective. Canvases from many world-class museums were collected including Kupka’s signature large paintings. As a founder of the abstract movement, František Kupka’s work paved the way for artists around the world. The collection features his life’s work chronologically, starting with his early pieces in symbolism and guiding the viewer down his creative journey towards the abstract. Another must-visit spot of the National Gallery is the Salm Palace adjacent to the Castle. #SalmModern opened on Dec 2nd and became a prime address for modern and contemporary art lovers. An exhibition called Dimensions of Dialogue features top Czech contemporary artists - Kintera, Bolf, Cernicky, Svankmajer and also a few gems by Yayoi Kusama, Keith Harring, Nan Goldin and Jean-Michel Basquiat. When there, stop for lunch, dinner or dessert and coffee (and a stunning view on top) at Kuchyn, a recently opened restaurant by Ambiente serving mostly best Czech recipes. Restaurant Kuchyn is located in the Salm Palace. Don’t miss out on your last chance to cash in on one of the best second hand markets around. Here, you can find everything from trendy clothes to international books to vintage vinyl. Snag a new outfit for yourself, or take advantage of low prices on gifts for your holiday list. This legendary venue has been home to some of the best musical performances in Prague, and in proper fashion, in-house DJs will be spinning sets all day to accompany your spree. Come for the shopping but stay for the food, drinks, and funky atmosphere. Learn more about the flea market here. Prague’s biggest ice-skating rink is an absolute must for anyone looking to partake in this winter pastime, and the best part about this rink is that admission is free of charge. Set in one of the most stunning parks overlooking the city, this may be one of the best places to enjoy the view of Prague in snow. Pack a thermos of hot cocoa and set up the perfect date night, or head over with friends and family for a day of nonstop fun. Admission: Free, skates available for cost rental. Learn more about Prague’s ice rinks here.